3) This Sunday Dhamma Talk (26/2/17, 10.00am) will be on the “Guardian of the Dhamma” by SJBA President, Bro Chim. 3) This Sunday Puja (19/2/17, 9.30am) will be led by Ven. Indarathana followed by a short meditation and Dhamma Talk. Venerable Indarathana was ordained as a novice monk at age 11 in Sri Lanka. After 10 years of monastic education and training at Sri Medankara Bhikku training Center, he received higher ordination as a fully ordained monk in 2007. He holds a Master degree in Buddhism at Kelaniya University and Bachelor degree of Law at University of Colombo. He is currently pursuing his masters of counseling at HELP University, Kuala Lumpur. 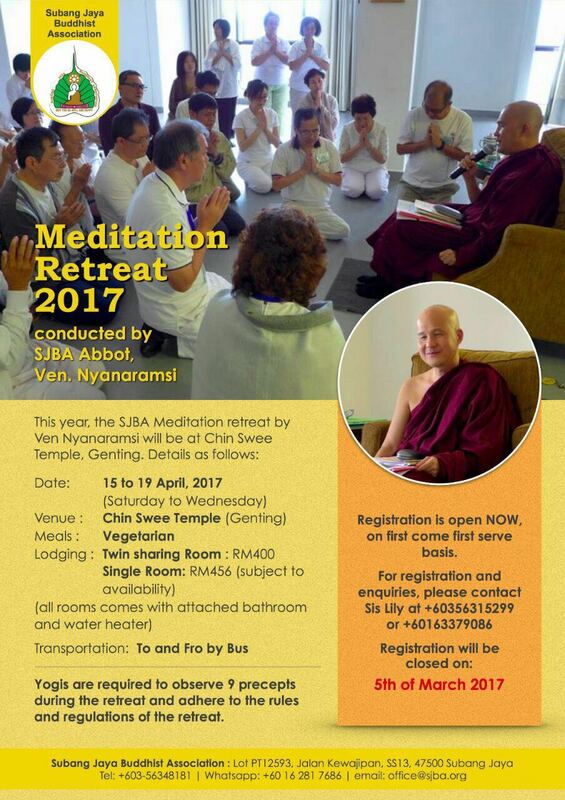 He has been living in Malaysia since 2012 under the guidance of Chief Reverend Saranankara Maha Thera at Sentul Sri Lanka Buddhist temple. As a Buddhist monk, he taught meditation and mindfulness practices and give counselling to people from different walks of life using the Buddha’s teachings. 3) This Sunday’s Dhamma Talk (10am, 12 February 2017) will be given by Bro Tan Siang Chye. Bro. Siang Chye graduated from Kent Institute, UK and with a Master degree from Massey University, New Zealand. He was a former Chairman of SJBA Dhamma Committee. He is a striving meditator and has practised under several prominent meditation teachers locally and in New Zealand. 2) This Sunday Puja (5/2/17, 9.30am) will be led by Ven. Indarathana followed by a short meditation and Dhamma Talk. Venerable Indarathana was ordained as a novice monk at age 11 in Sri Lanka. After 10 years of monastic education and training at Sri Medankara Bhikku training Center, he received higher ordination as a fully ordained monk in 2007. He holds a Master degree in Buddhism at Kelaniya University and Bachelor degree of Law at University of Colombo. He is currently pursuing his masters of counseling at HELP University, Kuala Lumpur. He has been living in Malaysia since 2012 under the guidance of Chief Reverend Saranankara Maha Thera at Sentul Sri Lanka Buddhist temple. As a Buddhist monk, he taught meditation and mindfulness practices and give counselling to people from different walks of life using the Buddha’s teachings.